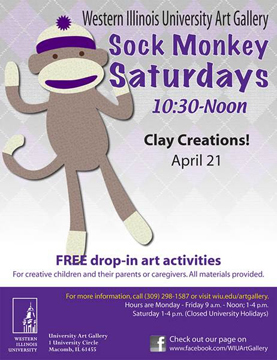 MACOMB, IL - - Western Illinois University's Art Gallery will host its Sock Monkey Saturday art activities from 10:30 a.m.-noon Saturday, April 21 in the Art Gallery. This Saturday's event will include clay creation for the children. All materials will be provided. All activities are open free to the public. For more information, visit wiu.edu/artgallery or call (309) 298-1587.